Watch out! If you add this Outdoor Room to your backyard, passing brides-to-be might stop and ask if they can hold their ceremony under your Pergola, next to a roaring fire! The "Cruz" Fireplace Project by Leisure will add elegant distinction to any outdoor area, giving you a ceremony-quality outdoor space that will stun and impress any visitor. Are you impressed by the design of this Fireplace, yet feel the color of the stone wouldn't match your home's exterior? Every fireplace project features customized materials chosen by the homeowners to match their porch, patio, deck or home. Pick and choose the color, shape and size of the wood, stone, stucco or granite; your imagination is your canvass! Family Leisure always offers the best outdoor room prices, so we guarantee you will save money. Get ready to impress every passing neighbor and visiting guest! Contact Family Leisure today and ask about the "Cruz" Fireplace Project by Leisure Select! Leisure Select offers a full line of outdoor fireplaces and pergolas that are custom made to your specifications, including size, color and type. 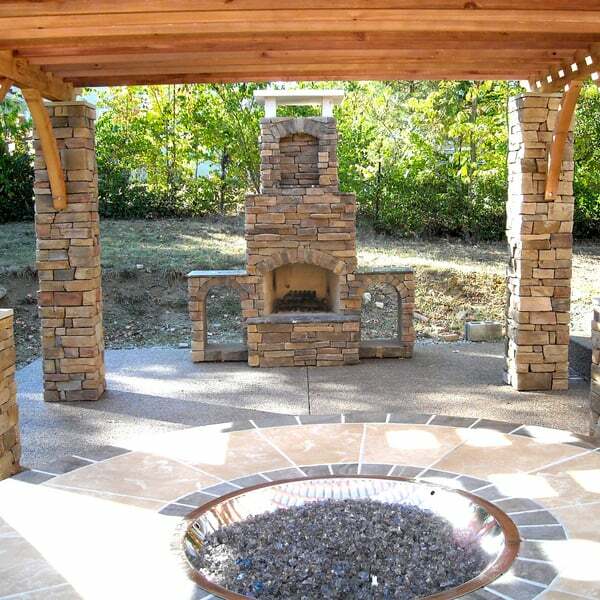 There are a variety of options to consider when building an outdoor fireplace or pergola and we specialize in helping you with the design. If you already have plans, or an idea of the look that you are trying to achieve, we can build it exactly to your specs. When it comes to quality, design and value, think of Family Leisure for the outdoor fireplace of your dreams. Bring us your ideas and let us help you customize the ultimate outdoor living area for your backyard or patio.